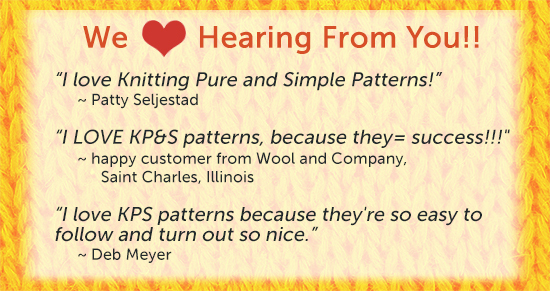 What is your favorite thing about Knitting Pure and Simple patterns? We love hearing from you and for your feedback. It’s especially fun to read through the great comments on Facebook in response to our fans who share their photos. Please keep sending in your photos and comments about Knitting Pure and Simple patterns. You can send them in through our Facebook page or feel free to send private comments through our contact page.